"Sixteen-year-old Miles Halter's adolescence has been one long nonevent - no challenge, no girls, no mischief, and no real friends. Seeking what Rabelais called the "Great Perhaps," he leaves Florida for a boarding school in Birmingham, AL. His roommate, Chip, is a dirt-poor genius scholarship student with a Napoleon complex who lives to one-up the school's rich preppies. Chip's best friend is Alaska Young, with whom Miles and every other male in her orbit falls instantly in love. She is literate, articulate, and beautiful, and she exhibits a reckless combination of adventurous and self-destructive behavior." I love books set in boarding schools. From Harry Potter to John Marsden’s very excellent and funny ‘Gatsby,’ if you stick a bunch of students in a building together I’m pretty damn happy. I think its because having so many people living together creates so many opportunities for mischief and drama, and also because I find the student/teacher relationship a hundred times more interesting than the teenager/parent one. So considering that I had already read and loved Paper Towns (review forthcoming, eventually), and that it was set at a boarding school, I was pretty much sure that I would like John Green’s Looking for Alaska. Which should have guaranteed that I wouldn’t like it, or at least that I would be a little disappointed by it. But sometimes the universe forgets to be contrary and you’ll start a book expecting to really like it and, against all odds, you’ll actually end up really liking it. The plot is simple; Miles, who likes to read biographies and memorise people's last words, convinces his parents to let him to boarding school where he hopes to find a fuller life. Now maybe it’s me, but does that sound boring or what? It’s probably because summaries of books I usually read include words like “superhero” or “apocalyptic” or “blood thirsty ninja-pirate-zombie-robots.” If I were to encounter an adult mainstream book that that plot I’d consider re-reading Twilight before I’d touch it, but YA books, especially YA books by John Green, have a secret weapon that makes up for the lack of ninja-pirate-zombie-robots (from Mars! ): the characters. A well written young adult character is worth twenty well written adult characters, in my book. And a young adult character written by John Green? Worth another twenty again. Take Miles. The kid is endearingly pretentious. He reads biographies of famous poets but thinks poems are boring, he dismisses the kids in his Florida home town and goes all the way Alabama in search of some new ones. (Is Alabama very from Florida? My knowledge of how the USA is laid out is being not so much…) He gets all bent out of shape when his new roommate doesn’t immediately offer to take him under wing, and yet, for all that he’s pretty damn likable. The supporting characters are just as real and engaging, and you get the feeling that John Green could have written a book from any of their point of views and it would have been a damn good book. The only character I had a tiny issue with was Alaska herself, and that’s only because I’ve also read Paper Towns and she seemed remarkably similar to that book’s Margo Roth Speigleman. The way both girls act, their flaws and personality quirks all line up. Even the way Miles would obsess over and describe Alaska echoed the descriptions from Paper Towns. (Or the other way around rather, as Looking For Alaska was published first). I’ll have to read more books by John Green before I form an opinion, but I do hope he has more than one kind of hyperactive, quirky female character in his repertoire. The thing I liked most about this book was the skillfull way Green builds up a sense of dread. The most obvious way he does this is by breaking the book down into bite sized sections, each one titled ‘x hours before.’ My reaction: X hours before what? X HOURS BEFORE WHAT? Something good? X hours before puppies and milk and sunshine? Hope for puppies and milk and sunshine all you want, but there’s more than enough clues to hint that that something unpleasant is coming. And the characters are just completely clueless, because obviously they can’t see the ’40 hours before’ hanging over their heads like we can. And eventually we hit 0 hours before, and the book shifts to ‘x hours after’ and while this isn’t as easy and light to read as the before section of the book, I think the After section was a richer and more fulfilling experience. Really the before and after parts of the novel read like two different books, but at the same time the book needs both of them. The after would not have been as powerful without the before, and before would have seemed too shallow and easy without the weight of the after. Wow, it’s really hard to talk about this book without spoiling things. 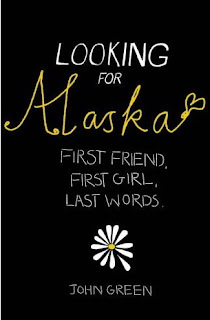 So I’ll leave it here with a final urge for you to go out and buy this book, or any book by John Green. I’ll even recommend the ones I haven’t read yet, completely confident I am of their awesomeness.